AFRICANGLOBE – The African Innovation Foundation (AIF) has announced the winners of its $100, 000 Innovation Prize for Africa (IPA), selected from a pool of top African innovators who are creating solutions to the continent’s daily challenges using a practical approach to entrepreneurship. “This year’s Innovation Prize for Africa winners showcase that Africans can find solutions to African challenges,” said founder of the African Innovation Foundation and the IPA, Jean-Claude Bastos de Morais. South Africans, Dr. Nicolaas Duneas and Nuno Pires won the African Innovation Foundation (AIF)’s Innovation Prize for Africa (IPA) 2014 for creating the first injectable porcine derived BMP medical device in the world. The Altis Osteogenic Bone Matrix (Altis OBM™) created by the South Africans can be used in treating bone injuries and voids using a regenerative biological implant. The IPA also announced two runners-up, who were chosen based on the business potential of their innovation and the social impact respectively. Togolese, Logou Minsob’s Foufou Mix, a food processor designed to replace the mortar and pestles (carved wood), used in prepare Foufou, a West African dish, won the innovation with the best business potential. Melesse Temesgen won the special prize for the innovation with the best social impact. The Ethiopian invented Aybar Broad Based Furrow Maker (BBM), a low-cost farming device that is used in draining excess water from waterlogged fields. IPA regards it as the only known effective device capable of creating drainage furrows for excess water while building a broad bed for planting. The invention of Duneas and Peres is seen as a much needed intervention at a time when Osteoporosis is on the rise in Africa. National Osteoporosis Foundation of South Africa (NOFSA) says Osteoporosis is increasing on the continent due to urbanization and a general lack of awareness. Now, patients diagnosed with serious bone trauma or degradation need not endure the removal of bone tissue from their hips or get from deceased donors. 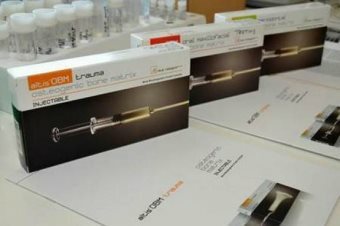 The injection of OBM gives fast, safe and effective healing of bone injuries. The winners were selected from about 700 applications from 42 countries, by a panel of jurors. They expressed delight at winning, stating that it was the result of 10 years of hard work. “Our team has managed the development of Altis OBM over the past 10 years, from the initial idea to commercialization, with the hope that the innovation will radically change the way orthopedic surgeons treat bones injuries. Winning the IPA gets us closer to that goal,” Altis OBM Chief Executive of Business Development, Nuno Peres said.